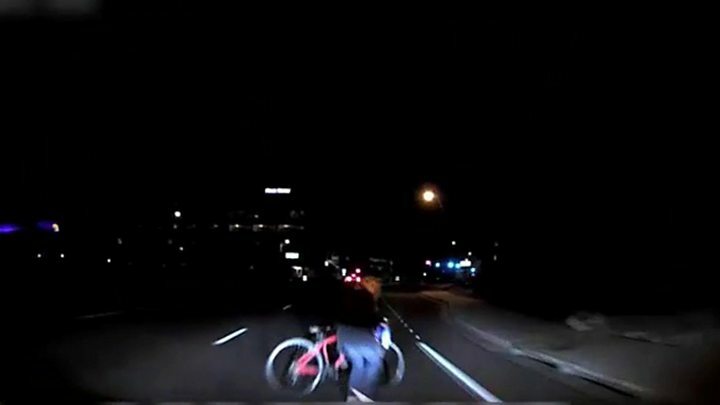 Police have released two videos showing the moments leading up to a fatal crash involving a self-driving Uber car in Tempe, Arizona, on Sunday. In the 14-second video, the autonomous vehicle is seen failing to slow down before hitting Elaine Herzberg, 49, who is walking her bike across the road. One video shows dashcam footage of the impact. The other, an Uber operator monitoring the car’s controls. Uber has suspended self-driving tests in North America following the crash. 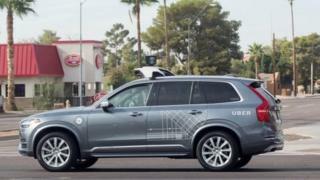 In footage released on Wednesday by the Tempe police department, the human Uber operator sitting inside the Volvo appears to be looking down at something while the vehicle is travelling in autonomous mode. Moments later, the woman appears visibly shocked as she looks up to see Ms Herzberg crossing the highway in their path seconds before impact. “The video is disturbing and heartbreaking to watch, and our thoughts continue to be with Elaine’s loved ones,” Uber said in a statement. “Our cars remain grounded, and we’re assisting local, state and federal authorities in any way we can,” the statement added. Police said the accident happened on Sunday night, adding that Ms Herzberg had not been using a pedestrian crossing. Ms Herzberg was taken to a local hospital following the collision but died of her injuries. The US National Highway Traffic Safety Administration and the National Transportation Safety Board earlier said they would be investigating the incident in Tempe. While self-driving cars have been involved in multiple accidents, it is thought to be the first time an autonomous car has been involved in a fatal collision with a pedestrian.